Etiquette of Good Society, 1893. Yes or No? by Charles West Cope, 1872. For Victorian ladies, there was much more to letter writing than simply dashing off a note. There were rules for proper correspondence, encompassing everything from acceptable shades of paper and ink to penmanship, wax seals, and conditions under which a woman must write in the third person. I can’t tackle all of these rules in a single article. Instead, I’ve gathered twelve quotes from various Victorian etiquette books addressing the basics of ladylike letter writing. I present them to you below. 1) Use Good Quality Writing Paper. 2) Use the Proper Color of Writing Paper. The Ladies’ Book of Etiquette and Manual of Politeness, 1872. 3) Use a Good Quality Pen. Etiquette, Politeness, and Good Breeding, 1870. 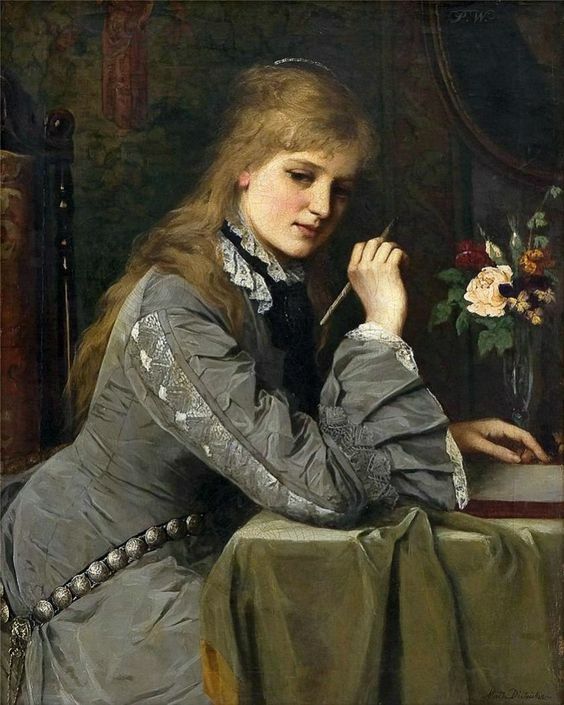 Letter Writer by Johanne Mathilde Dietrichson (1837-1921). 4) Use the Proper Color of Ink. Hand-Book of Official and Social Etiquette, 1889. 5) Pay Attention to Your Handwriting. 6) Begin with the Correct Salutation. “The salutation is the term of politeness used to introduce a letter, as Dear Sir, My Dear Friend, My Honored Father. Business letters generally begin with Sir, Dear Sir, Messrs. or Gentlemen. Never use ‘gents.’ for Gentlemen, nor ‘Dr.’ for Dear. For a letter addressed to a married woman or a single woman not young, the proper salutation is Madam, Dear Madam, or My Dear Madam. Polite Life and Etiquette, 1891. The Letter by Alfred Émile Léopold Stevens (1823-1906). 7) When Addressing Friends, Write in a Conversational Style. 8) When Addressing Strangers, Write in the Third Person. 9) When Addressing Gentlemen, Watch Your Tone. 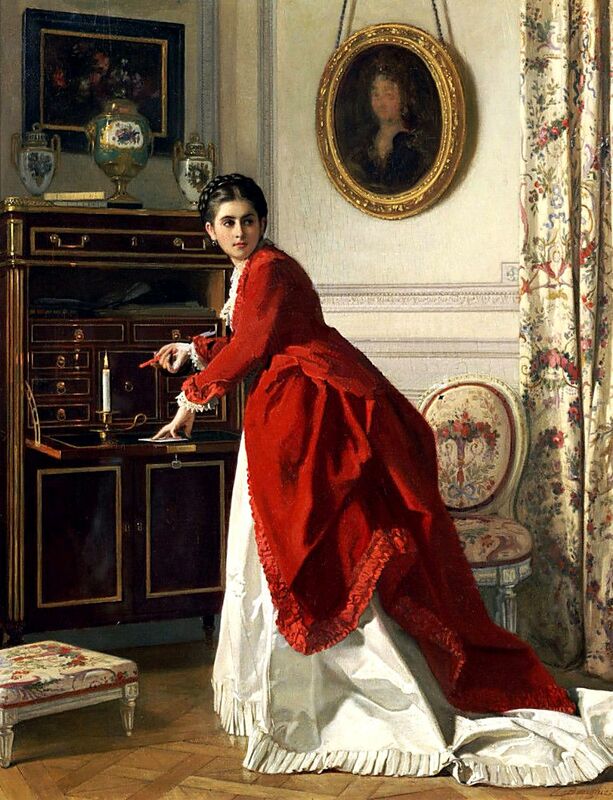 The Letter by Charles Baugniet (1814-1886). 10) Close Your Letter with the Appropriate Sentiment. 11) Proofread for Grammar and Spelling Mistakes. 12) Seal Your Envelope Properly. 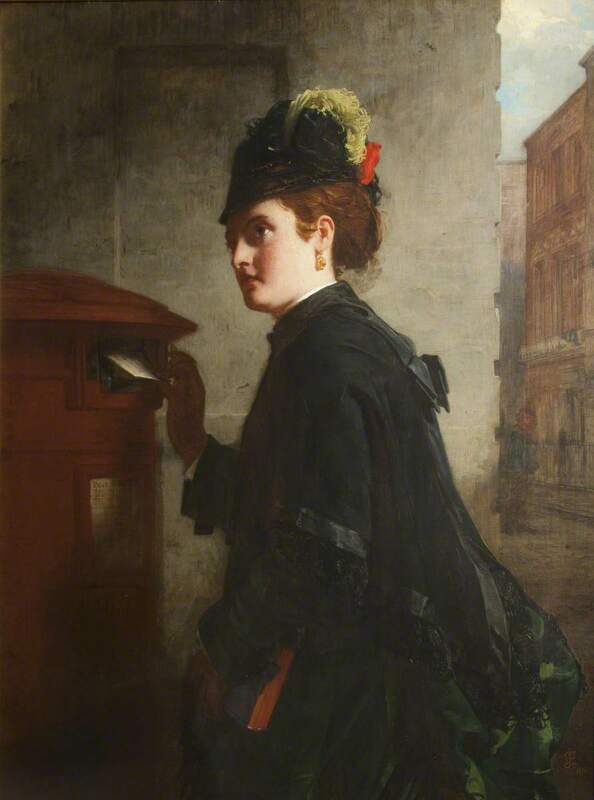 The Pillar Box by Alexander Johnston, 1876. I hope the above tips have given you some insight into the etiquette of Victorian era letter writing. In future (when I’m not working frantically to meet a July 1st book deadline), I will be writing on this subject in more detail. Until then, check out these articles from my archives on letter writing in nineteenth century literature and history! Benham, Mrs. Georgene Corry. Polite Life and Etiquette; Or, What is Right and the Social Arts. Chicago: Louis Benham & Co., 1891. Campbell, Lady Gertrude Elizabeth. Etiquette of Good Society. London: Cassell and Company Ltd., 1893. De Benneville, Randolph Keim. Hand-Book of Official and Social Etiquette and Public Ceremonials at Washington. Washington: Randolph Keim De Benneville, 1889. Eaton, Arthur Wentworth Hamilton. Letter-Writing: Its Ethics and Etiquette. New York: Frederick A Stokes, 1890. Etiquette, Politeness, and Good Breeding. London: Ward, Lock, and Tyler, 1870. Hartley, Florence. The Ladies’ Book of Etiquette and Manual of Politeness. Boston: Lee & Shepard Publishers, 1872. Rayne, Mrs. Martha Louise. Gems of Deportment and Hints of Etiquette. Detroit: Tyler & Co., 1881. Great post, Mimi! Will share. Thanks so much, Regan :) I’m glad you enjoyed it! Thank you for an excellent post! I always enjoy your blog, a true oasis of civility in a busy world! You’re very welcome, Tory :) And thank you for the wonderful compliment! Yes, definitely an excellent post. I will have to use, some if not all, this information when I do my letter writing. Yes, I have several friends and we exchange posts. An absolutely delightful post! I always enjoy reading excerpts from Victorian etiquette books. Me too, Angela :) Victorian etiquette books are the best! Disallowing for #8, I’d say very little has changed as far as letter etiquette. Thank you for this post! Most of that sounds like good advice for today’s letter writing, too–except the part about writing in third person, which seems ridiculous in the extreme! That part is rather silly, but it certainly explains a lot for those of us reading letters of that period! As someone who still sends pretty handwritten letters, values proper grammar, and loves that some people still value etiquette, this post was an absolute delight to read! Wonderful! Thanks so much for your comment, Wendy :) I’m so glad you enjoyed it! A great post, as always, Mimi. Will share. What a great story, Ann :) I hadn’t heard of Sophia La Roche before. Now I’m going to have to read more! Such fun! We forget how important letter writing was as the only form of long distance communication. I’m glad you enjoyed it, Olivia :) And you’re right about the importance of letter writing in the 19th century. People took letters seriously! Can you imagine what the rules would be for using online communications for ladies in the Victorian Era if the modern day technology existed back then. Rule #9 actually reminds me of the modern advice on sending emails, i.e. one should never send anything that one wouldn’t feel comfortable being read aloud to a room full of strangers.